As these are longer than the plastic paddles, do they fall to hand better? Using the plastic paddles means keeping your hands on the spokes. I find them much easier to operate for the reason you mention - I tend to drive with my hands gripping the wheel where the bulges are and the extended ones are just the right length for me to lightly pull with the tips of my lower two fingers without even thinking abut it. With the original shorter paddles I had to slide my hand down sightly to trigger them which made feel it a little forced. I do have quite small hands though. The paddles are identical fitment across all the current Jaguars and a lot of Range Rovers too. They are on eBay all the time now for about £200 a pair. That seems like an insane price for something so small and simple. I'll keep my gold ones. I bought mine of ebay for £180. At that price, they're worth it. 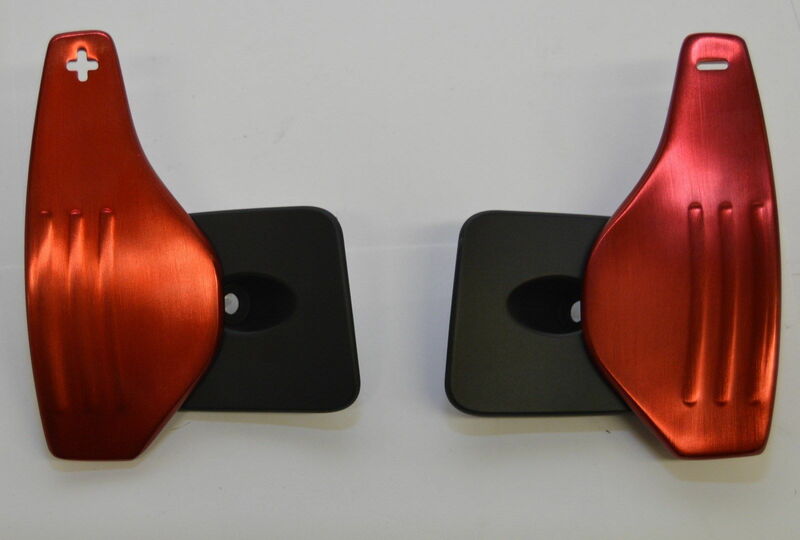 In the FWIW department, Land Rover Discovery has optional red anodised paddles for a similarly high price - if they fit the F-Type (as people say they should), they might be a nicer option for some cars. Last edited by mshedden; 10-13-2015 at 06:18 PM. Jaguar exec's must smoke only the best if it costs $600 for the aluminum paddles. Wow... would love to have them but screw that. It should be standard equipment imo. The stock ones feel way to fragile and cheap. In addition to the high price the aluminum ones are not lit but the symbols are cut out. And yes the Land Rover paddles are identical. XK owners have bough the red ones and they are a direct replacement. They don't need to be the red ones. I bought the silver (brushed aluminium) ones and they work just fine too (in my opinion the silver ones look much classier/more harmonious than red would in an otherwise black/silver/wood cockpit). Last edited by JustNiz; 10-16-2015 at 11:13 AM. You know, I'd not noticed the standard items were lit? The cutouts and asymmetric shape seem to overcome any difficulty in telling which one is which though. The stock ones seem about perfect to me...but what do I know. I don't want them noticeable, whether it's orange, red, or big and aluminum. I don't want to look at them, I simply want to feel them in the right place. I want them subtle and as small as possible, which the OEM, base car, black ones are. I think the red ones could be nice in a black cabin if you also have the red stiching and red seatbelts. Just bought these for $485 USD. They are very easy to self install, 20min tops (do requie a T20 star drive). They do have a more solid feel than the platic ones IMO, and are slightly longer, but the finish is not of great quality, almost too chrome like and the +/- are not illuminated like with the original plastic ones. The original gold color looks better to me, and I may switch them back. I wish they made them in the same anodized bronze color to match the start and dynamic buttons. Overall not a good value, and you wont feel special having put them on your car. Looks like a flat bottom steering wheel can be had on Ebay for $1500 as a value comparison - these should be $75.